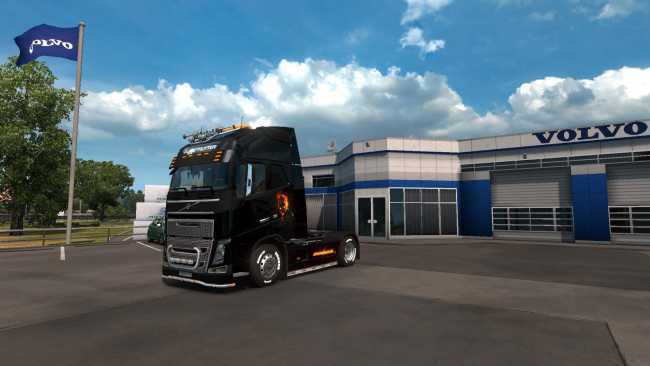 Mod adds Skin Ghost Rider for Volvo FH 2012. Mod adds Skin Ghost Rider to the trailer. 53 chassis, 7 original and 44 extra. More than 230 Skins (if you have all the DLC). Original accessories, front grille, front mirror, side mirror, side skirts, tanks, cranes, rear bumpers, middle exhaust pipes, small lights, Eagle Eyes Lights Crane, Stone Guard, front hook cover and body. Original accessories for the interior, Light Boards, toys and rear lights for the interior. Front and rear Krone tires.